Because it seems like there has been far fewer Horned Grebes at the Port Orchard Marina this year, because it has been quite awhile since I’d been there, and because Spring has been unusually warm, I was worried I would miss seeing the Horned Grebes in breeding colors this year. So, Sunday I decided that I wouldn’t worry about the dripping toilets (I turned them off), the unfinished taxes, the furniture still stuffed in the garage and the extra bedroom, or the weekly groceries; I would go to Theler Wetlands and Port Orchard for the day. It’s probably a good thing I did because, I was shocked at how few birds there were at Port Orchard. In fact, not counting gulls, a Great Blue Heron flying far overhead, and a single Pigeon Guillemot, I only saw three other birds. 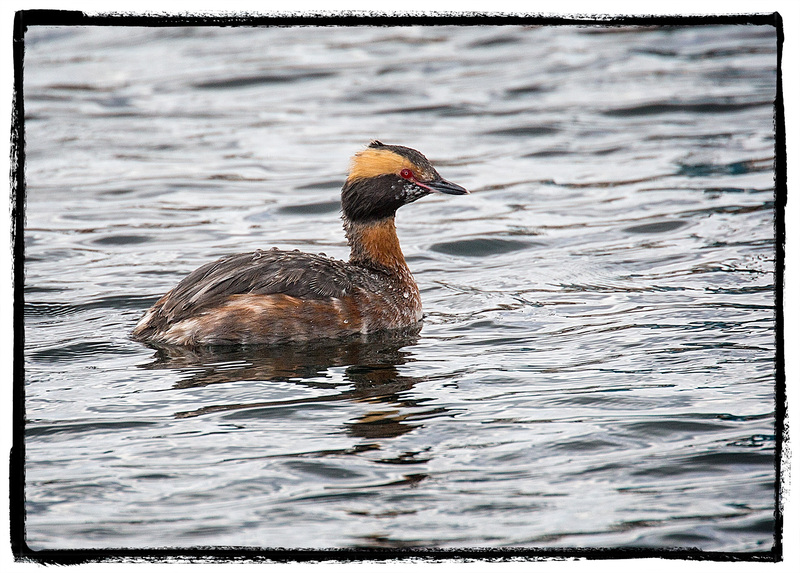 Luckily, two of the three were Horned Grebes in breeding color. On my first trip through the marina, I saw a single grebe at a distance, but it was immediately clear that it was in breeding colors, despite the number of white feathers on the breast. I felt lucky when we saw another grebe right next to the dock as we were about to leave, even though I had to shoot directly into the sun. When you get this close the direction of light seems less important. The grebe was either preoccupied with catching a meal or was willing to show off its new garb because it dove and resurfaced remarkably close to me several times. This one shot I got from the side, though, clearly shows the importance of sun direction when taking photographs, as the horns seem much more dramatic with sunlight glowing through them. 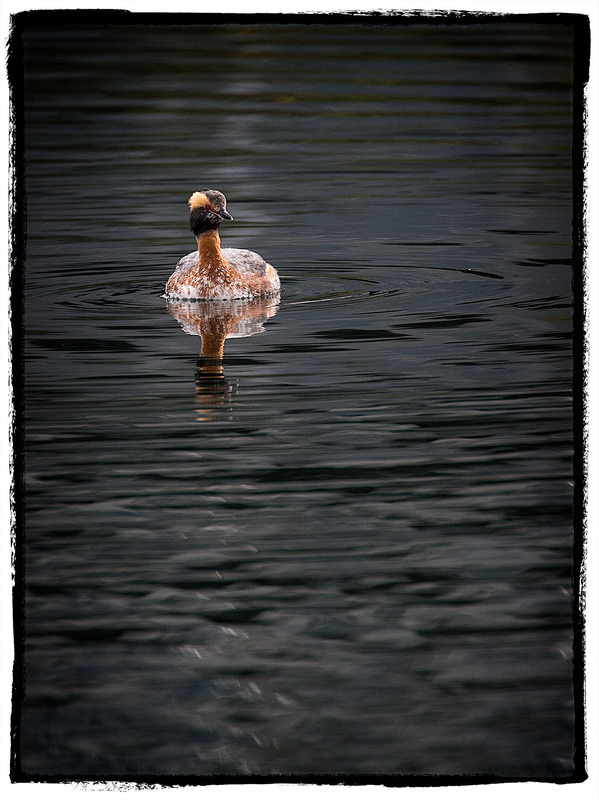 Even if the sun manages to dispel these clouds this week I’m afraid that the Horned Grebes will be gone when I return. 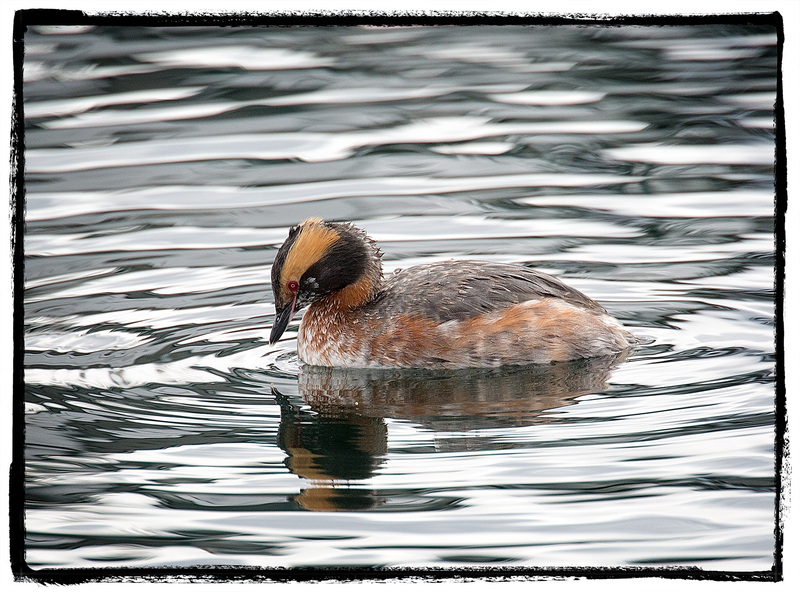 Perhaps it is precisely this limited time to see the grebes in breeding colors that makes them seem so precious. 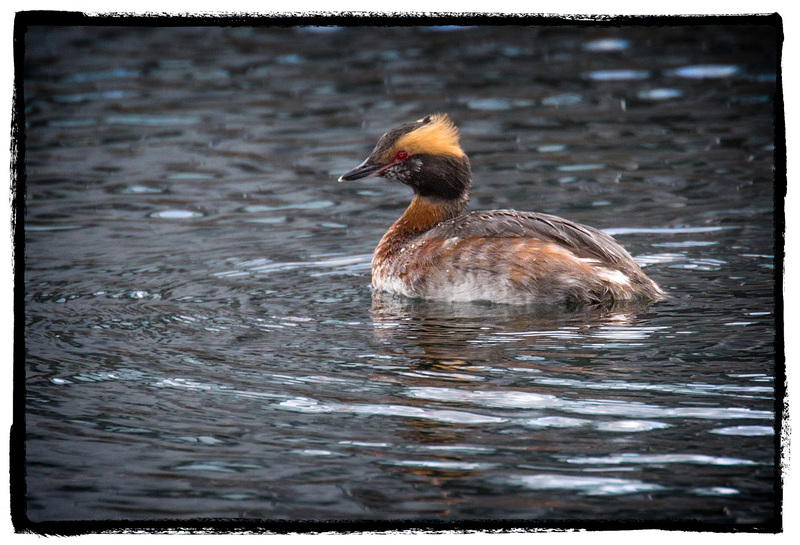 You are so lucky to see these Horned Grebes in their breeding plumage. We see a couple of species of Grebes here in winter. They’re cute, but in breeding plumage they’re spectacular. Great shots! Yes, I do consider myself blessed to see them in breeding plumage so close to home. Too often I have to drive hundreds of miles to see birds in their breeding plumage, or, worse yet, I never get to see them in that plumage.